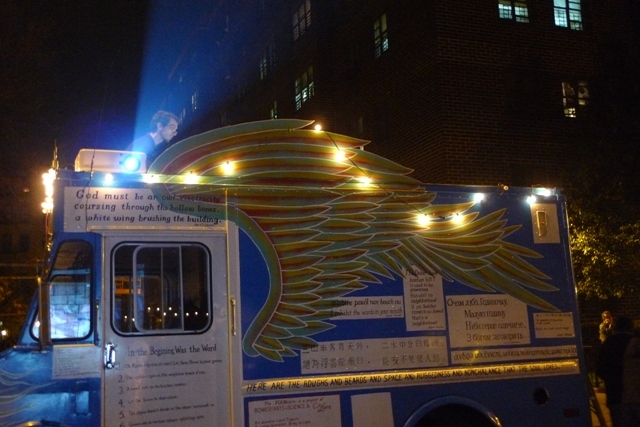 Featured poets performing in the languages of the Lower East Side: Belye Gottesman (Yiddish), Virlana Tkacz (Ukranian), Sandra Maria Estevez (Nuyorican Spanish), and Xien Huang (Cantonese) and building-sized poem projections on the New Museum. Hosted by Bob Holman. 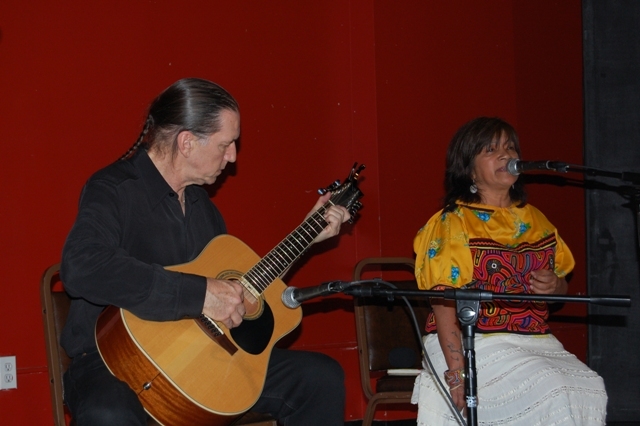 Poetry and music at the American Indian Community House. With Mohawk, Tuscarora, and Navajo poets including Vickie Ramirez and Eugene Billie along with a musical performance by Soni Moreno Caballero, formerly of Ulali, and a screening of the documentary Little Caughnawaga: To Brooklyn and Back about New York’s Mohawk community. Hosted by Danielle Soames, Poetry Ambassador. 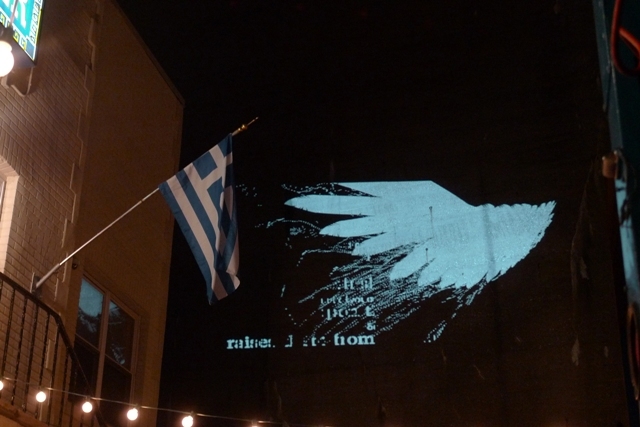 Greek-American Poetry at the Federation of Hellenic Societies. Hosted by Dean Kostos & Anastasia Tsantes, Poetry Ambassadors, with poets, musicians, and dancers honoring their Greek heritage. Featured projections on the neighborhood’s landmark Hell Gate Bridge along with a commemoration of the 100th anniversary of the birth of Nobel Laureate Odysseas Elytis. A special Program with Lincoln Center Out of Doors at Pregones Theater featuring projections of the poems of Mayde del Valle, Tzetzal poet from Chiapas, Mexico, Enriqueta Luñez, and Douglas Kearney, among other poets and music groups. Hosted by Bob Holman with Bobby Sanabria on congas accompanying the text. 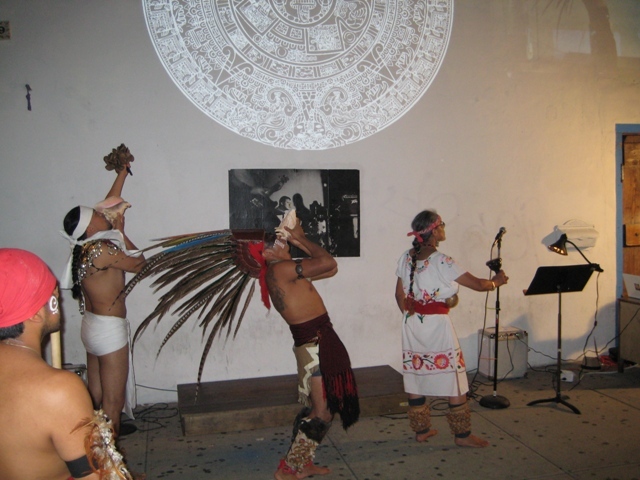 Hosted by Raúl Hurtado, our Poetry Ambassador, poets Gabriel Rivera, Judith Flores, Chepo, and Abelardo Duran read their poems, projected onto the facade of the La Terraza Café, along with an animated version of the Aztec calendar. Ballet Folklorico Mexicano de Nueva York performed the danzón, a national dance of Cuba, though beloved in Mexico, due to the large number of Cuban musicians who made their home in Mexico City in the 1940s and 1950s; and the show opened with an indigenous Mexican chant and dance performed by Cetliliztli. Haitian Poetry and Music at Five Myles Gallery in collaboration with Haiti Cultural Exchange and La Troupe Makandal with poets Josaphat-Robert Large, Michele Marcelin, Denize Lauture, & Jennifer Celestin. Music by Frisner Augustin & La Troupe Makandal. Hosted by Régine Roumain of Haiti Cultural Exchange and Lois Wilcken of La Troupe Makandal with projections of vèvè and contemporary and classic Haitian poetry. The POEMobile team and Urban Word collaborated with other artists from the festival and Modul8 experts to help youth poets create something far from a traditional poetry slam. Participants from Urban Word worked with Hive NYC to help them combine their passion for poetry with digital tools, with guidance from strong mentors and access to larger platforms than they normally have. During this process they interacted with poets like mentor Jon Sands, as well as interactive artists like Julia Vallera and Chris Jordan, to help shape their growth as learners and artists. 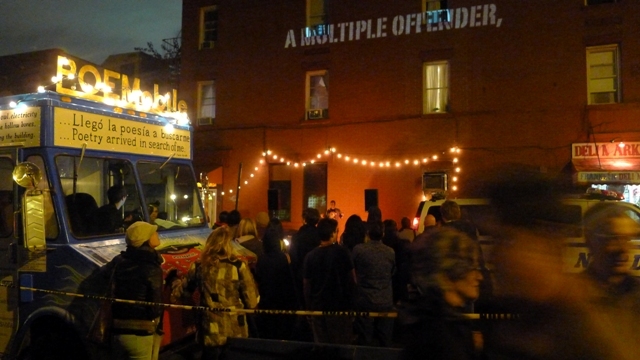 The project culminated in an event at the festival hosted by Bob Holman. 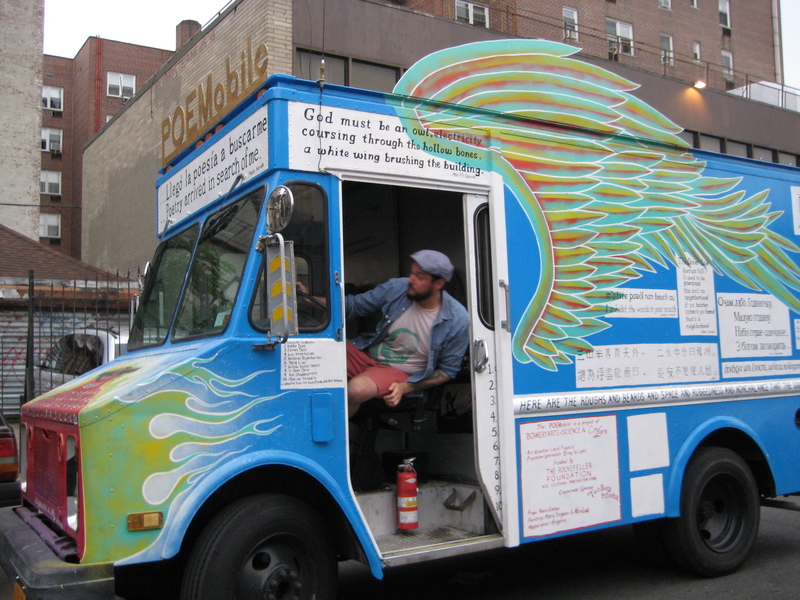 The POEMobile visited the Nuyorican Poets Cafe in Loisaida. Appropriate to Alphabet City (East 3rd between B and C), the letters were writ large and projected life size on the legendary birthplace of Nuyorican poetry. 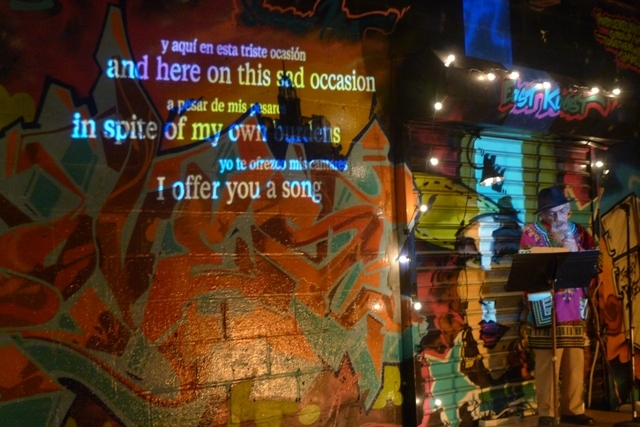 The projections accompanied readings by the Nuyorican pioneers, Tato Laviera, Lois Griffith, Jesús “Papoleto” Meléndez, Louis Reyes Rivera, and Sandra Maria Esteves, who hosted the event.